Helen Weng is currently a doctoral student in clinical psychology studying the Department of Psychology, Waisman Laboratory for Brain Imaging and Behavior, and Center for Investigating Healthy Minds at the University of Wisconsin - Madison. Her long-term goals include studying how interventions that increase love and compassion impact both psychological and physical health in patients, and how training these qualities in health care providers can prevent burnout and improve patient outcomes. 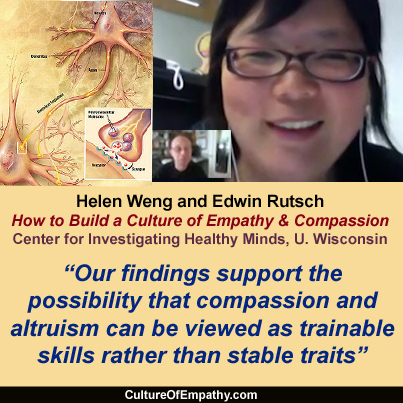 Helen conducted a study titled, Compassion Training Alters Altruism and Neural Responses to Suffering. "Compassion is a key motivator of altruistic behavior, but little is known about individuals’ capacity to cultivate compassion through training. We examined whether compassion may be systematically trained by testing whether (a) short-term compassion training increases altruistic behavior and (b) individual differences in altruism are associated with training-induced changes in neural responses to suffering. " "Compassion is a key motivator of altruistic behavior, but little is known about individuals’ capacity to cultivate compassion through training. We examined whether compassion may be systematically trained by testing whether (a) short-term compassion training increases altruistic behavior and (b) individual differences in altruism are associated with training-induced changes in neural responses to suffering. In healthy adults, we found that compassion training increased altruistic redistribution of funds to a victim encountered outside of the training context. Furthermore, increased altruistic behavior after compassion training was associated with altered activation in brain regions implicated in social cognition and emotion regulation, including the inferior parietal cortex and dorsolateral prefrontal cortex (DLPFC), and in DLPFC connectivity with the nucleus accumbens. These results suggest that compassion can be cultivated with training and that greater altruistic behavior may emerge from increased engagement of neural systems implicated in understanding the suffering of other people, executive and emotional control, and reward processing." 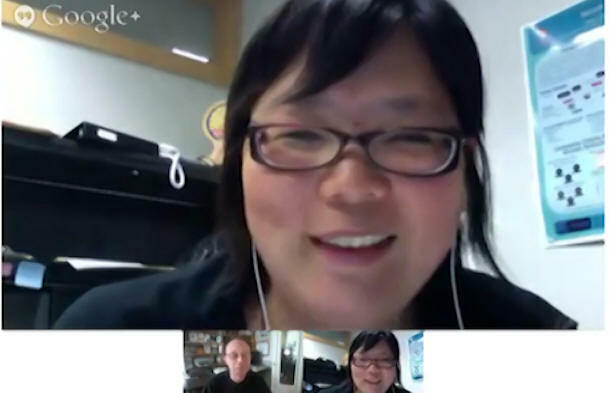 "Helen Weng, like thousands of other Madison residents, is reaching the end of that long crawl toward a Ph.D. Unlike many of the University of Wisconsin’s underpaid grad students, Weng already has had a taste of the limelight that is usually reserved for full-fledged professors. The national journal Psychological Science recently published a study by Weng that suggests adults can learn to be more compassionate. How so? Through a meditation CD, of course. And by repeating nice phrases like “may you have joy and happiness.”"
A new study by researchers at the Center for Investigating Healthy Minds at the Waisman Center of the University of Wisconsin-Madison shows that adults can be trained to be more compassionate. The report, recently published online in the journal Psychological Science, is the first to investigate whether training adults in compassion can result in greater altruistic behavior and related changes in neural systems underlying compassion. "Our fundamental question was, 'Can compassion be trained and learned in adults? Can we become more caring if we practice that mindset?'" says Helen Weng, a graduate student in clinical psychology and lead author of the paper. "Our evidence points to yes." "Can people be taught to act more altruistically? Newly published research, measuring both brain activity and behavior, suggests the answer just may be yes. “Our findings support the possibility that compassion and altruism can be viewed as trainable skills rather than stable traits,” a research team led by Richard J. Davidson and Helen Weng of the University of Wisconsin-Madison writes in the journal Psychological Science. Specifically, they report that taking a course in compassion leads to increased engagement of certain neural systems, which prompts higher levels of altruistic behavior." Feeling B*tchy? There's Compassion Training for That. It's hard to admit this, but sometimes I can be kind of a B. Maybe I had a bad day, maybe I haven't eaten in the last three hours...but in any case, I've been known to snap at my man or give the side-eye to the woman taking forever in the grocery checkout line from time to time. Not. Cool. But, apparently, harnessing one's chi to be a little bit more patient, compassionate, and more pleasant to be around in general is actually pretty easy, at least according to new research from the University of Wisconsin-Madison.
" A new study shows that adults can be trained to be more compassionate -- and in a relatively short time. Researchers at the Center for Investigating Healthy. People seem to become more sensitive to other people’s suffering, but this is challenging emotionally,” Weng explained. “They learn to regulate their emotions so that they approach people’s suffering with caring and wanting to help rather than turning away.” There are many possible applications of compassion training, according to Dr. Richard J. Davidson, founder and chair of the Center for Investigating Healthy Minds and senior author of the article." There are all sort of things that would make the world better. Raising the minimum age for members of “Boy Bands” by about 15 years could, for instance, only elevate music and the general human experience. Changing the name and focus of the film series “Fast and Furious” to “Slow and Calm” would also be a step in the right direction. A few stern words of caution to whatever fashion troll dreamt up the “onesy” would certainly lift the level of the collective unconscious. Perhaps greater than any of these much needed steps though, is the need for a rise in levels of basic human compassion. If this seems an impossibly lofty goal to you then a new study offers hope because it shows that compassion is really a matter of training your brain. When people teach themselves compassion, altruistic behavior increases. ...For example, new research demonstrates that you can “learn” compassion through specific meditative practices fairly quickly; and, intriguingly, that teaching yourself to become more compassionate directly translates to altruistic behavior. This latest study, conducted at the University of Wisconsin’s Center for Investigating Healthy Minds, founded by Richard Davidson, the leading researcher in this field, investigated whether you can train adults to become more compassionate; and whether that results in greater altruistic behavior and changes in related brain activity. Well, you can, and it does.